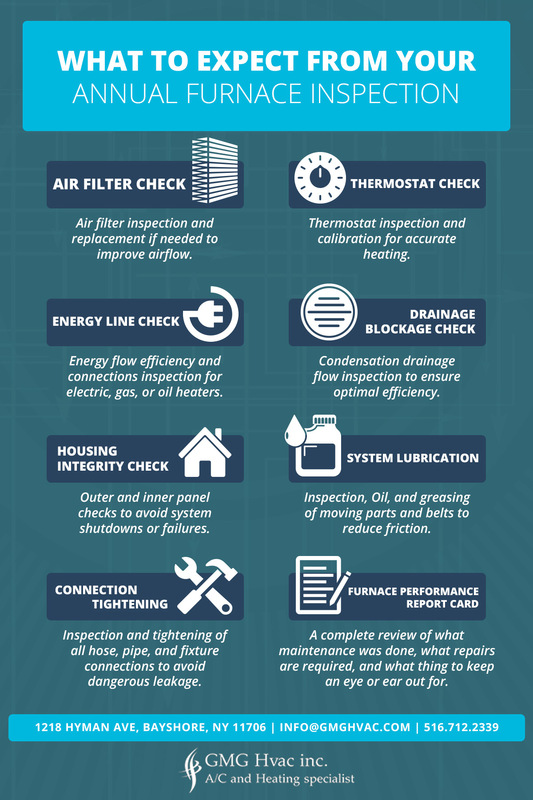 In last week’s blog from GMG HVAC, we covered some important items you should put on your HVAC checklist for fall, including changing your air filter, cleaning your heat registers, adjusting your thermostat settings, and calling GMG for routine HVAC maintenance. In today’s blog, we will focus a little more on the very last piece — the in-home heater inspection and what to expect from this important, annual heater checkup. As a Bethpage resident, you know that beginning in December, we typically average nighttime lows below freezing into the early spring. Making sure that your heater is up to its task this winter will save you time and money while also giving you the peace of mind that your family will be warm and cozy as the snow outside falls. 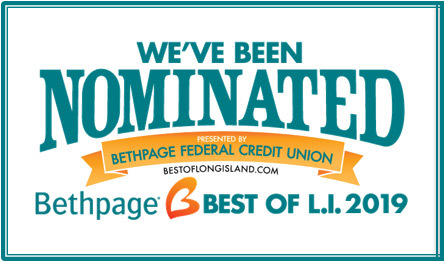 At GMG HVAC — your local, trusted HVAC company — we specialize in the various types of heating systems you are likely to find around Bethpage including electric, gas, and oil. If you need the professionals at GMG to give your furnace an inspection before the cold weather settles in to stay the season, contact us today. But hurry, appointments for this crucial HVAC service fill up quickly. Dirty filters are one of the biggest culprits of airflow problems, excess dirt and dust in your furnace, and winter allergies. If you haven’t changed your air filter recently, our HVAC technician can do it for you. We strongly recommend learning where your filter is and how to change it. Quality filters should be changed quarterly, while cheaper filters may need to be changed as often as every month your HVAC system is in use. Proper thermostat calibration is crucial to the comfort level of your home. More importantly than comfort though, a thermostat that is improperly calibrated can cause excess energy usage and wear on your heating system from abnormal cycling. 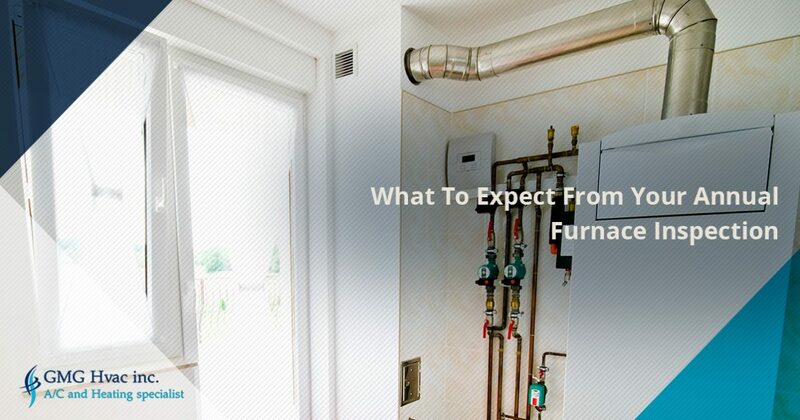 Your furnace is one of the more complex pieces of machinery in your entire home. Various connections, energy source lines, and internal parts make furnaces an item that really needs professional attention. A routine fall furnace maintenance call should include checking and tightening any connections, monitoring proper functioning of important internal systems like the heat exchanger, and making sure that no gases are escaping, wires are exposed, or connections are loose. Any of these systems that are not in good order can be extremely dangerous for you and your family. Additionally, your technician will lubricate the moving parts and check the belts on the fan. Burner blockages and condensation blockages can both impact the efficiency of your heater in different ways. Over a long enough span of time, they can also produce significant problems that can require expensive repairs — especially if a breakdown comes midwinter. All of these must be in proper working order for safety and the longevity of your heater. Any loose panels or improperly sealed housing can cause heat and gas to space from your heater, causing a system shut down, or possibly worse. When your HVAC technician is finished with his maintenance, he will share what he worked on, noticed, and what his recommendations for any important repairs are, allowing you to get ahead of a breakdown. Call GMG HVAC today for a professional HVAC maintenance appointment and save yourself the frustration and money of an emergency repair this winter. We look forward to helping you keep warm.